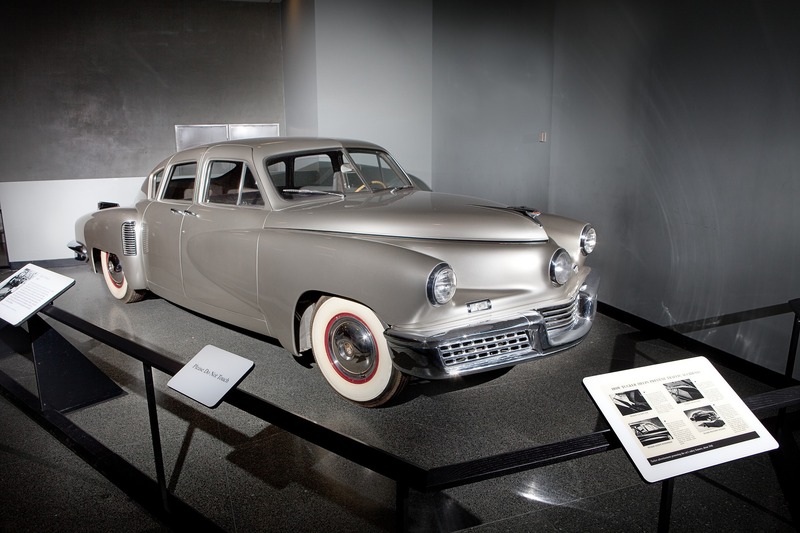 Preston Tucker promoted his 1948 automobile as “the first completely new car in fifty years.” He believed that a rear-mounted engine and rubber suspension would improve performance and reduce noise, fumes, and vibration. The Tucker car’s safety features included a center headlight that turned with the front wheels, and collision protection in the form of a pop-out windshield, padded dashboard, and a place to crouch under the dashboard. Avant-garde styling gave the car a futuristic appearance and an air of power and speed. The Tucker Corporation built 51 cars before production stopped because of financial problems. Preston Tucker received a design patent for his new car in 1949, after production ON the Tucker had stopped. Preston Tucker planned and promoted his car enterprise on a scale as grand as his ambitions. He leased the largest factory in the world, one of many steps that earned the upstart automaker widespread attention for his radical ideas and new designs. But Tucker couldn’t match the vast financial assets of Detroit’s leading automakers, and his project failed. The 1948 Tucker had more safety features than ordinary mass-produced cars. Cars in the 1940s had safety glass but little else to protect motorists in a collision. Mass-produced cars had no seat belts, and dashboards were made of bare steel. The collapsible steering column was only a patent drawing. A padded dashboard became standard equipment on the 1948 Tucker and 1949 Chrysler, but other automakers did not adopt safety devices until the 1950s. Tucker ads promoted safety features that other cars lacked. A mother poses behind the wheel of the Tucker while her daughter crouches in the "safety crash chamber." Preston Tucker (second from left) was found not guilty of fraud and conspiracy. Undercapitalized, Preston Tucker desperately sought financial backers. He pursued venture capital, offered stock, sold dealerships, and presold accessories. The last two acts caught the attention of the Securities and Exchange Commission. The government launched an investigation and obtained criminal indictments against Tucker and six other company executives . The seven eventually were found innocent, but disgraced in the press, the company already had failed. In 1990, California required automakers to sell some emission-free cars within eight years to help ease smog conditions. General Motors manufactured and leased hundreds of EV1 electric cars to consumers between 1996 and 2004. The EV1 was the first modern electric car designed for the mass market. Its advanced power management system made it practical, powerful, energy efficient, and appealing to consumers. But GM canceled the EV1 program, citing high production costs and a small potential market. Click here to see more objects related to the EV1 and its Development Team. Southern California’s sunny climate and robust economy attracted millions of residents, bringing cars and smog. In Los Angeles, a layer of warm desert air over cool ocean air often trapped smog (hydrocarbons reacting with sunlight) inside the city’s ring of mountains. Automakers converted vehicles to run on battery power and leased them in preparation in preparation for California’s mandate to sell emission-free cars. General Motors’s designed-from-scratch EV1 combined fresh styling and good performance. Lessees liked its drive qualities, comforts, and appearance. Robert Beaumont manufactured CitiCar electric cars in response to the 1973–1974 gasoline shortage. Tesla began manufacturing electric cars in 2008. Electric car advocates protested automakers’ decision to suppress a promising, environmentally friendly technology. New demand for electric cars, and the market success of hybrid cars, prompted automakers to manufacture and sell battery electric cars by 2008. California motorists led the nation in adopting electric cars, with more than 100,000 battery and plug-in hybrid models on the road by 2014. 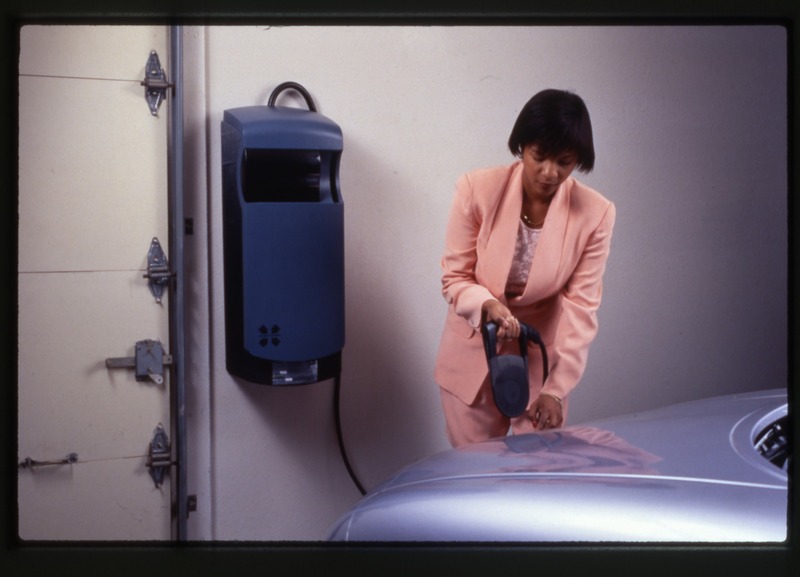 Consumers in General Motors’s EV1 test program paid to lease a car and received a battery charger for home use. Charging at home, especially overnight, was convenient, but limited range, the miles a car could travel per charge, required a new infrastructure of charging stations wherever electric car owners drove or worked. Electric car manufacturers sought ways to increase range and reduce charging time. Do Cars Need to Change? Many people tried to reinvent the car because they thought it was unsafe, inefficient, too large, too dependent on fossil fuels, or harmful to the environment. Concerned inventors, business people, and consumers wanted sustainable cars. Radical changes sometimes reached the market and attracted some consumers. More often, automakers resisted change. They updated existing designs and technologies to satisfy the majority of consumers, who wanted the proven benefits of conventional cars: power, convenience, comfort, and economy. Detroit’s leading automakers continued to use established technologies and energy systems—because they worked well and were profitable.